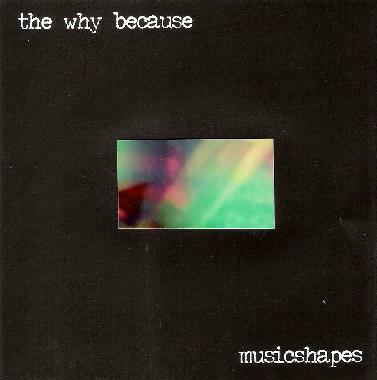 The Why Because - "Musicshapes"
The band describes itself as "blending elements of space rock, fiery jazz, ambient haze, and dubby, percussive stomp". I mention this because it's a starting point to trying to describe their music, but it's not entirely accurate. Jazz is definitely the strongest element of the mix, but I wouldn't call this fiery. Like the music of Sun Ra, this is jazz that is out there. Perhaps not as out there as Sun Ra got on some of his truly avant-garde recordings, but The Why Because are definitely explorers. They temper the sound with rhythms that seem a little more modern though, but it's not all rhythmic in nature. They often veer off into more experimental and occasionally free form directions, allowing almost ambient-like textures to evolve in the playing. There's very little in the way of space rock here, though space is a good word. The Why Because skirts the edges of outer and inner space as they search for something undefined. Whatever that might be, it's up to the listener to decide. All improvised, recorded live, this is the kind of music that might appeal to fans of Mushroom, though it is a little more out there than Mushroom tends to go. I was able to give the album a few spins before writing this review, and if I sound a little hesitant in my words and descriptions, it's because this is the kind of album that really takes more than a few listens to appreciate. It takes a while to get beneath the surface of this kind of music. I haven't had the chance to do that yet, but it's got me enough that I certainly plan to. For more information you can visit The Why Because web site at: http://www.musicshapes.com. Hear The Why Because at: http://www.myspace.com/thewhybecause.